The Barnes & Nobles Nook Firmware 1.1 seems to be speeding things up in turns of page flipping and navigation but I still find it slow and laggy compared to my Kindle 2. Check out the firmware in this video from Matthew Miller from ZDNet. My new entry over at CNET Asia Community Blog is up. This week’s entry, “The Best Food Site on Hong Kong Restaurants”. Click here for the full read. Adobe has launched Photoshop Camera Raw 5.6, Lightroom 2.6 and DNG Converter 5.6 for immediate download. Release candidates of all three had already been available from the Adobe’s Labs site. The updates fix minor issues and provide additional Raw support for 20 more DSLRs, including the Canon EOS 7D and Nikon D3S, with additional DNG support for the Leica M9 and Ricoh GXR. Click here to find out more and download Adobe Camera Raw 5.6 or Lightroom 2.6. With Thanksgiving gone and Christmas coming in less than three weeks, what is the ultimate geeky gadget you can get at an affordable price for those gadget lovers? Well, check out the Gboard which was launched earlier this week. The Gboard is the ultimate gift for Gmail lovers or should I say, addicts. 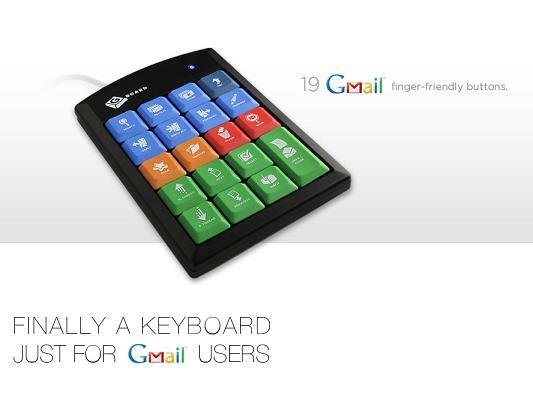 This keypad features 19 different colored keys, each pre-programmed with a keyboard shortcut for functions such as replying, forwarding, deleting, starring, and archiving messages and keys to allow users to navigate by message or discussion, select messages, search, and flag messages as spam and so on. Although the Gboard limits the shortcuts to 19 out of the 65 Gmail shortcuts, it is still a nifty gadget to have around. The Gboard is easy to setup, just plug in via the USB and tweak the settings in Gmail and you’re done. It is compatible with the Mac and PC. Another attractive factor is the pricing, only US$19.99. Check it out over at Gboard’s Web site. For more on the Gboard, take a look at the video below. My new entry over at CNET Asia Community Blog is up. This week’s entry, “My Tech Predictions for 2010”. Click here for the full read. Would I want to buy one? nah, not now. Check out this review from Engadget if you want to know more about the HTC HD2. Local Hong Kong street price for the following gadgets as requested from users.